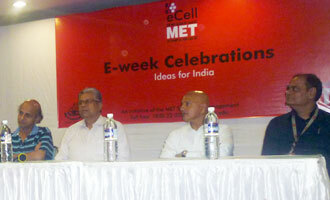 MET eCell created a platform for budding entrepreneurs during the E-week from 15th to 19th March 2011. E-week was a week-long campaign to build awareness and inspire public support for entrepreneurship. The members of eCell arranged a number of compelling lectures, workshops and panels designed to ignite the passion for entrepreneurship. MET eCell had invited luminaries from across the entrepreneurial spectrum, they shared their journeys with the students of our college and highlighted on what it takes to be an entrepreneur. The events started on 15th March, lighting a inaugural lamp by Prof. Vijay Page, Director General – MET IOM along with the prestigious speakers like Mr. R. Sriram, Owner - Crossword, Mr. Milind Agarwal, Owner - Smsgupshup.com and Mr. Gautam Gulati, COO - Kiah Diamond Jewellery, who have achieved and pioneered ventures and innovations in their fields. They narrated their unheard stories from scratch to success. There was a panel discussion held at the MET Convention Centre. We had four highly successful entrepreneurs who were there to shed light on the finer things that make an entrepreneur. Our panellists included Mr. Vishwanathan, CTO - Smsgupshup.com, Mr. Karthik Raichura, Owner - Managementparadise.com, Mr. Prakash Mundra, Owner - Sacred Moments and Mr. Rahul Mota, Owner - Talent Nirvana. They addressed on the challenges and the road to entrepreneurship. Another highlight was the stalls set up by our very own enterprising students who have a passion of becoming an entrepreneur and eCell in a way gave their dream budding wings. The week also had a number of mini-competitions and management games which were designed to inculcate among students the spirit of entrepreneurship and foster the belief of developing and working towards their own ideas and aspirations. The events ranged from how to revive a dying product to how to come up with a viable business plan, to how to analyse and capitalize on your SWOT analysis. There were also outdoor events which tested student’s analytical and judgemental skills. Their ability to think in an open environment and to identify the problems prevalent in a given environment and what best would help resolve the same. Mr. Pramoud Rao, MD - Zicom Electronic Security Systems, who himself had walked down the entrepreneurial path while starting his enterprise. Mr. Rao addressed on innovations and novelty he brought about in his business to start and develop his business. He left all those present with an inspiring message and deep thoughts about entrepreneurship. The E-week was finally concluded by the prize distribution ceremony where all the winners were duly awarded by Prof. Vijay Page, Director General – MET IOM and our Chief Guest, Mr. Pramoud Rao, MD – Zicom Electronic Secruity Systems. This year E-week received an overwhelming response. From it being a small event for the members of the eCell, the E-week turned in to a huge event where every management student of MET was a part of. In response, to the gusto and ecstatic mood of every member of eCell, will try to bring a better and bigger E-week next year.